"Parrot's Bay" - the boat with parrots! 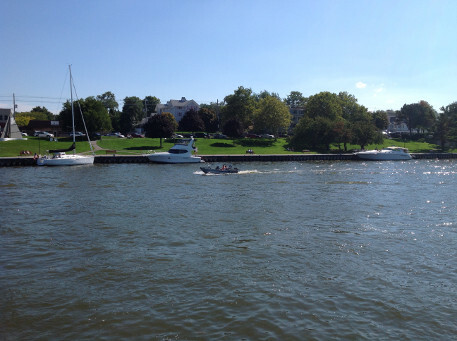 Sightseeing charters available on Lake Michigan, the Grand River and Spring Lake located in Grand Haven Michigan. 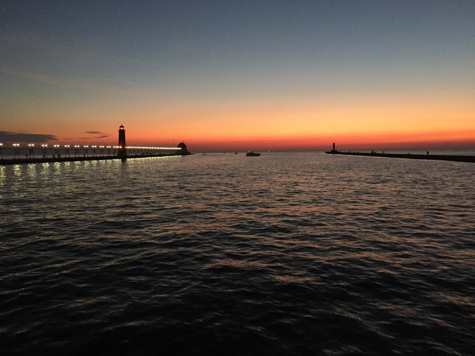 Relax and experience the beauty of West Michigan's favorite waterfront, enjoy an amazing sunset or ride up the Grand River to explore history and nature that you can't easily see from shore. 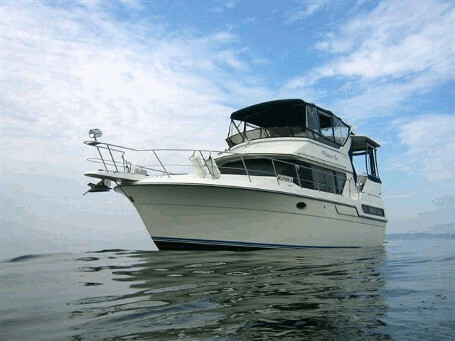 Our vessel accomodates a maximum of 6 passengers. Please call during our regular business hours to schedule your tour. Note that if you're calling outside of our business hours, you can leave a message and we will return your call as promptly as possible. Call or text: (616) 345-0555 - to book your charter today! While on the upper deck, you will be about 15' above the water, seated along side and in front of the captain. Unlike a "fishing boat", you will not be facing backwards, on a lower deck filled with fish odor and dangerous fishing tackle. "Parrot's Bay" is built for comfort and relaxation, not for fishing. 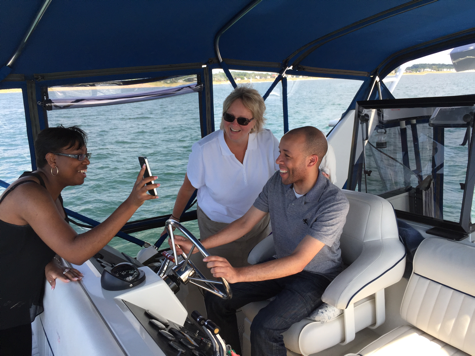 In addition to the family friendly amenities, annual vessel safety inspections are conducted with the US Coast Guard Auxilliary. This is done to insure all safety gear meets or exceeds any reasonable possibility. 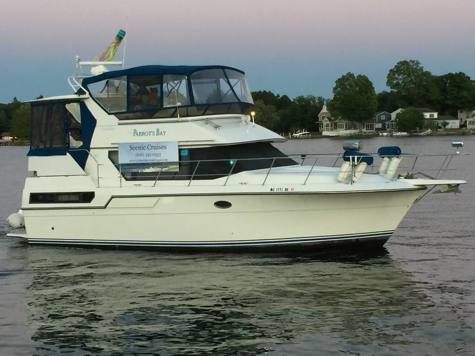 The "Parrot's Bay" was built by Carver Yachts in Pulaski Wisconsin, near the shores of Green Bay. She is the third vessel of her type constructed in 1991. Measuring 36' in length, 13' 10" abeam, her interior features two state rooms, 2 heads (aka restrooms), a galley, dining area and salon.The upper deck provides seating for the captain & passengers. "Parrot's Bay" is named in honor of the parrots that ride along when weather permits. I'm a master electrician and automation trainer by trade, but nothing makes me happier than being out on the open water. The result has been a lifetime of experience in both power and sail boating. 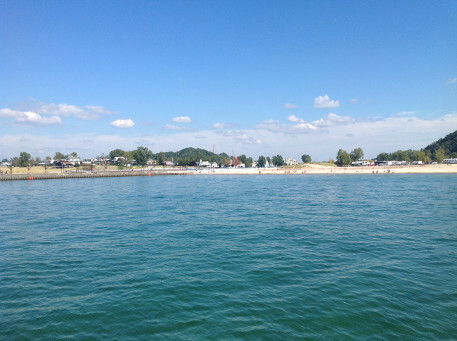 One experience I will never forget is my first time heading onto Lake Michigan from the Grand River. 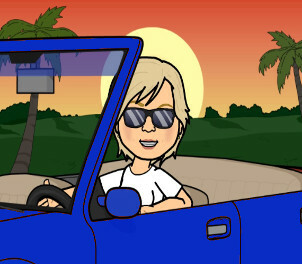 It was a sunny day with 2 foot waves, and I remember wondering if it was safe to take an 18' boat where I was going. Turns out it was safe, but that adventure lead to many more, and the adventure continues still. 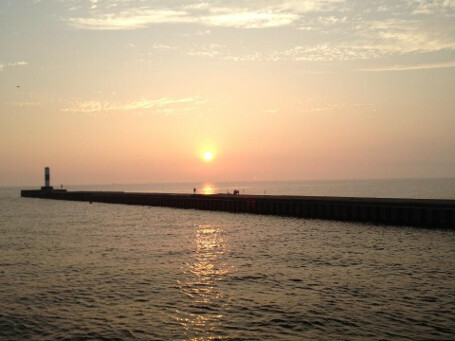 I can say that being on the shore of Lake Michigan, enjoying the endless sunsets is a lifetime of treasure! While that reasure is incredible, it pales in comparison to getting out on a boat and becoming part of the show. It is this amazing feeling that I have shared with almost all my friend and family. Now as a master captain, I enjoy bringing this same experience to you. 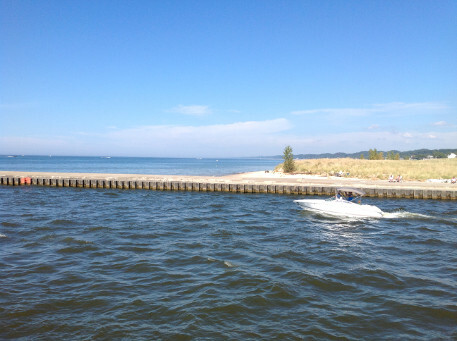 I love Lake Michigan, and I'm confident you will too! By day I work in the Investments Industry but in my fun time, I'm a fish! 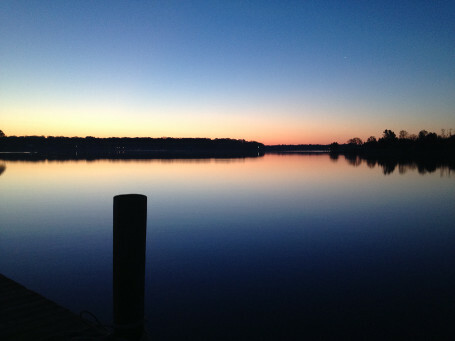 I love everything that has to do with being in or on the water!! 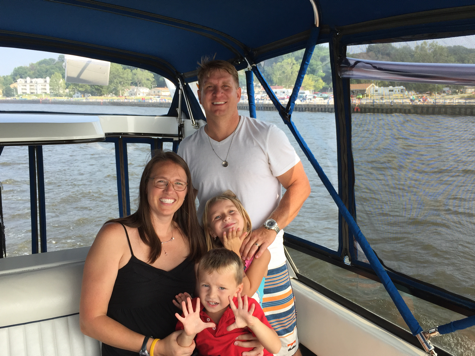 Having grown up with boats, it was natural that my husband & I dove deeply into the boating life. Having had both power & sail boats, it was our experience with an '89 SeaRay Sundancer that escalated our addicton & lead to the purchase of our current boat. Our captains are U.S. Coast Guard Licensed 100 Ton Master Captains and graduates of U.S. Captains Training. 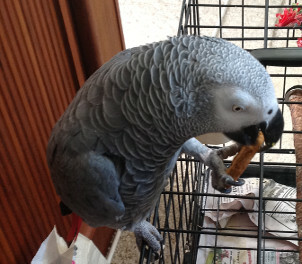 Tiki was our first parrot and is our most well behaved. 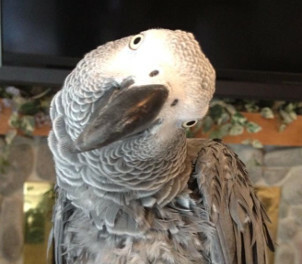 He is an African Grey with a large vocabulary and the ability to mimic a wide variety of sounds. 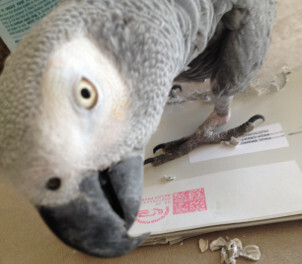 Parrots like to be the center of attention and use their sound skills to attract it; this is especially true of Tiki. However, when he is already the center of attention, don't be surprised if you don't hear much from him. Pretend you don't notice him or walk away and you're likely to hear all kinds of sounds, from water bubbling to a conversation on his imaginary phone! Diesel is an Umbrella Cockatoo & the newest addition to our flock; he is very cuddly once he gets to know you. Diesel will be sure to make you feel welcome as he often dances as a greeting. 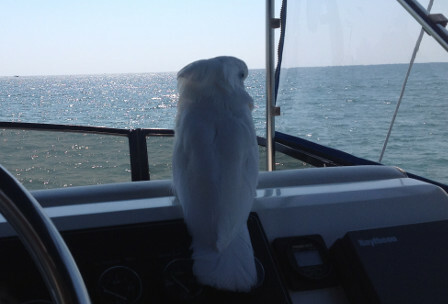 You will probably find him perched on Captain Kim's shoulder. Sunglasses and Sun screen. A hat or visor may also be helpful. Light jacket in the summer, warmer clothes in Spring and Fall, air temperature over the lake is often 10 degrees cooler than on land. Wear soft sole shoes, please. No hard or dark sole shoes may be worn on the boat. Bare feet are allowed. Camera with fim or memory cards. 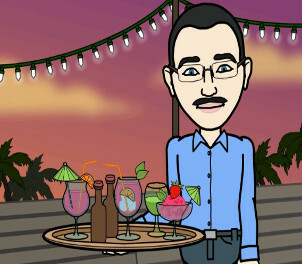 We do not serve alcohol aboard, but you may bring along adult beverages. Be aware that alcohol can greatly enhance sea sickness and is not recommended. Please do not bring red wine or other drinks that will easily stain. Snack foods are permitted. Please choose items that will not stain or destroy light carpeting. Child size life vests are available on the boat, but kids often prefer to wear their own. Children under 13 years of age must wear life jackets at all times. Crew members will also wear them as examples of safety. Each cruise will be started with a short safety briefing and welcome aboard tour; therefore, please plan to arrive 15 minutes ahead of your scheduled departure time. If you are travelling from a great distance, it is wise to call ahead to verify that weather conditions are acceptable for a departure. Many times weather on the lake is different than on land. Plan ahead to avoid disappointment. Important: since we cannot control the weather, we are not responsible for delays or cancellations made for the sake of safety. In the event of a cancellation, we will gladly reschedule at the earliest convenient time for all involved. Thank you for your understanding. While aboard it is required that passengers remain seated whenever possible. Children must be supervised by their parent or guardian, who are held responsible for their behavior. Please don't let your children break anything you don't intend to purchase. 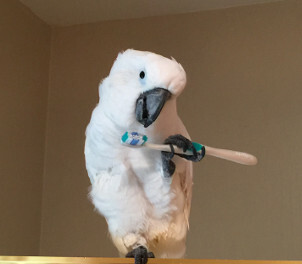 Be advised that the parrots are fun to look at and fun to talk to, but they should not be handled without the permission and supervision of crew members. 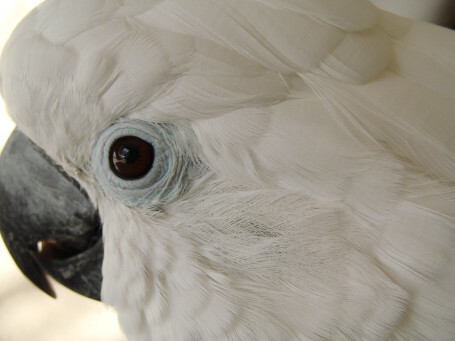 Birds are delicate, so are your fingers; lets keep them separated. Weekend tours are often accompanied by our 3 parrots when weather permits. If anyone in your party prefers to tour without birds aboard, please let us know in advance to permit us to make other arrangements. Our boat is in slip 23 at North Shore Marina. Please contact us to make cruise arrangements. 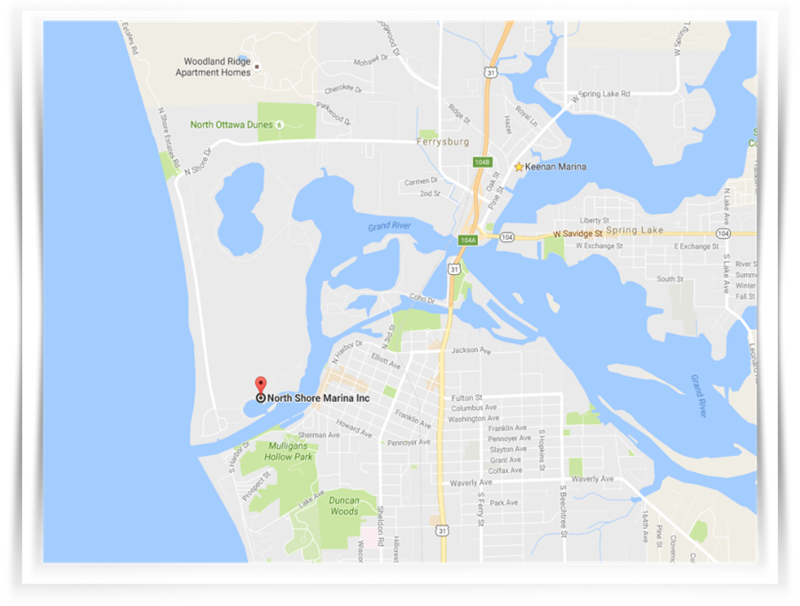 Please do not contact the Marina for cruise information, as they are not affiliated with our business. Copyright 2018 - Crystal Blue Cruises Inc.
Payment Methods: You may pay entirely for your charter using PayPal, there is a 3% convience fee when using this method. You may also pay cash for your charter with payment due at the time of boarding. When paying with cash, please use the PayPal link below to submit a booking depost. Cancellation Policy: In the event that Crystal Blue Cruises is forced to cancel a charter for any reason, we will attempt to reschedule at the earliest convenient time for all invloved. If rescheduling is neither practical nor preferred, then a full refund will be issued. If for any reason a client wishes to cancel a charter, a full refund minus credit card processing fees will be issued if we are provided 48 hours notice of the cancellation. When less than 48 hours notice is provided the booking deposit is not refunded. By using the PayPal link below, you indicate that you understand and agree with these terms. Please read the following information carefully: In order to book a charter, it is necessary to contact one of our captains to arrange a time and date; to do this you can call or text (616) 345-0555. Please note that both captains have other daily commitments and may not respond to your request outside our regular business hours. We will, however, respond as quickly as we are able. Once a time has been established for your charter, please use the payment method listed below. Important Notice: Charter bookings are for a maximum of 6 passengers. Master Captain Kim - Gives boating lessons! We get frequent requests for boat handling training. Captain Kim is one great teacher and will be glad to assist. Kim is proficient in twin engine boats, both large and small. Take the fear out of learning to manage that expensive boat back into your slip on a windy day. Kim has landed our 36' Carver Aft Cabin boat without a scratch in....get this....78 MPH winds. If she can do that, she can land just about any boat, anywhere, any time....and will help you to do the same. Her skill is approved by the United States Coast Guard, and endorsed personally by me, her Co-Captain...the guy who was tying lines the day she landed in high winds. Kim charges $50.00 per hour for training, no yelling, no panicking....just a relaxing time boosting your boat handling confidence. Call her today if you could use a boost from a patient captain. Crystal Blue Cruises is closed for the season, please join us again in the Spring of 2019 for a sightseeing charter. Thank you to all our 2018 guests for an amazing year of chartering, our best ever!